Just when you thought your in-flight experience couldn’t get any more hi-tech, both Panasonic and Thales are bringing out a new ‘sci-fi’ user interface to try and enhance our in-flight experience. Perhaps off the back of the new X-Box Kinect technology, it seems that the ‘Minority Report’ way of interacting with computers is actually going to be our future. 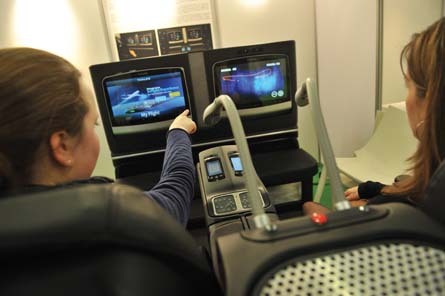 Thales is yet to be outdone though, and in the Aircraft Interiors Expo 2012 in Hamburg, they showed a way of interacting with the IFE with body movement on it’s prototype Avant system using infrared cameras. Apparently the way to use it would be as if imagining the screen at about chest level in front of you. Obviously doing away with the need to interact with touch screens will save airlines vast amounts of money in maintenance, and will please those who are afraid of getting a bug from unsanitised surfaces. But like Siri on the iPhone, will it be more difficult to use than intuitive and will it leave us reaching for our handset controllers? Whilst the technology is still being tested it will be a few years before a product like this will reach the market, both companies eager on simple forward steps rather than leaps, to allow consumers to keep in tune with the IFE systems, rather than leaping ahead and losing their intuitive user interface. I for one, am looking forward to watching films whilst throwing my arms about and causing great injury to my fellow travellers. Who knows, perhaps Ryanair will be selling elbow pads and helmets in the future?